Dan Usner and Paul Trevor have known each other for a while. Usner is a history professor at Vanderbilt University. He grew up in New Orleans. Trevor is curator of Native American and Pre-Columbian Art at the New Orleans Museum of Art. Paul brought Dan in to the museum to see baskets made by the Chitimacha Nation that are part of NOMA’s collection. The Chitimacha live on tribal lands in Charenton, Louisiana, about a two-hour drive from New Orleans, and just twenty miles from hot sauce central Avery Island. They Chitimacha have lived there for centuries, and are among a few Louisiana tribes that weren’t forced west when white settlers came to town. 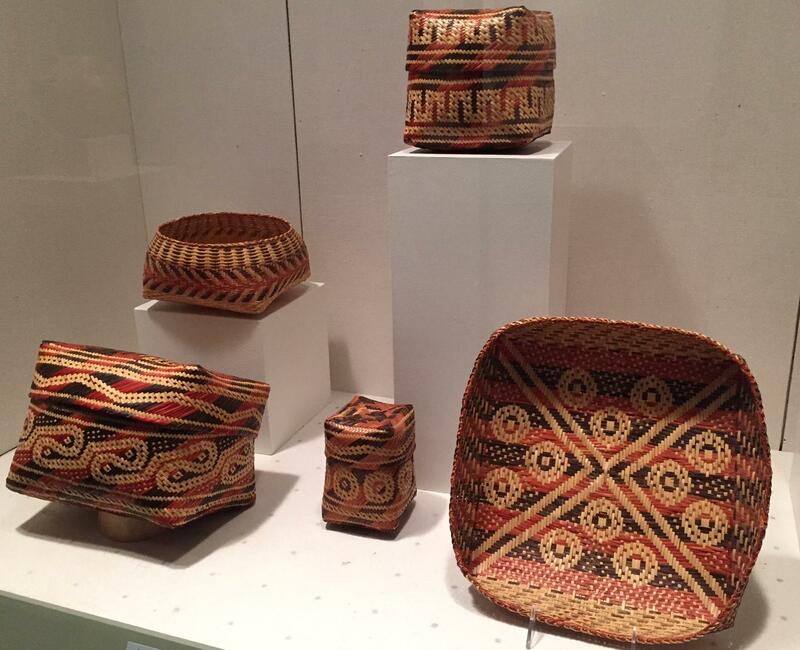 Chitimacha baskets on display at the New Orleans Museum of Art. With their teeth. Then they would dye some of the strips in water boiled with either the hulls of black walnut or a root called swamp dock. And then start the weaving. Credit McIlhenny Company Archives, Avery Island, La. 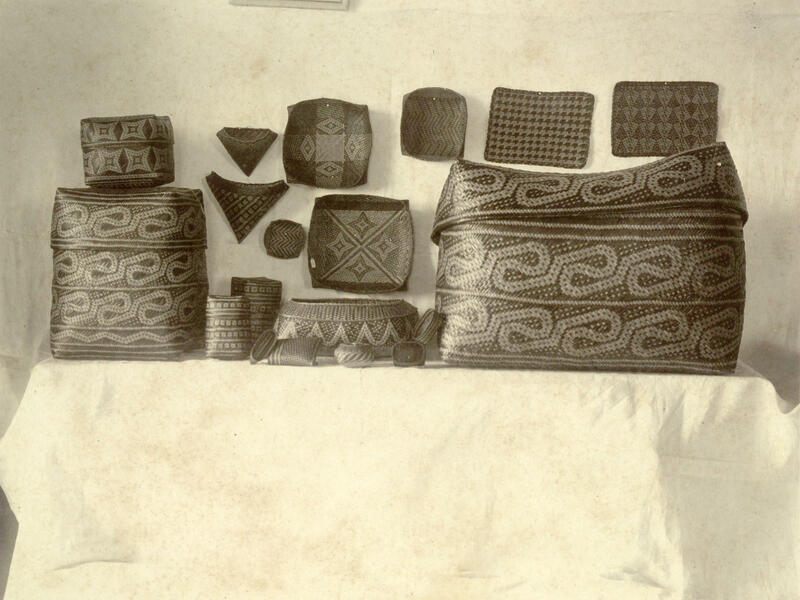 Chitimacha women made the baskets. And another group of women took a liking to them. This phenomenon can be seen across the country in the late 19th century -- affluent white women taking interest in indigenous crafts, and seeing themselves as "saviors"’ of an at-risk population and art. This patronage was commercialized through the Christian Woman’s Exchange. Women's exchanges were widespread across the United States as places where, on consignment, crafts produced by local women, mainly rural women, could be sold. 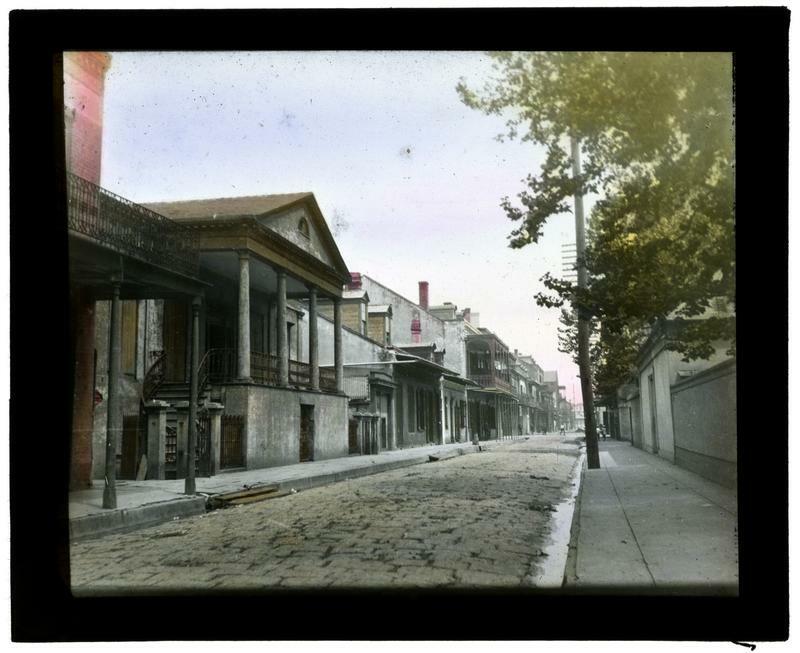 And that was the case for the New Orleans store, located on Lafayette Square in the late nineteenth/early twentieth century. This is where the family behind Tabasco comes in. The McIlhennys. Which plays a part here. 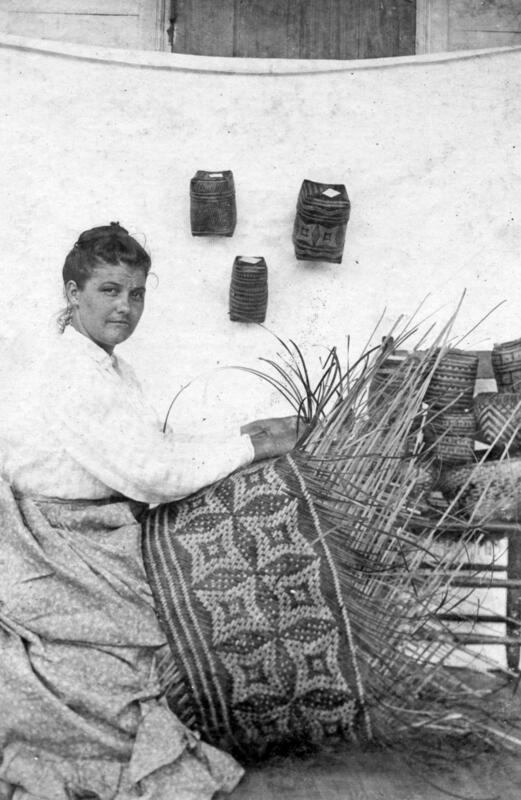 When the McIlhenny sisters -- Sarah McIlhenny and Mary Bradford -- saw the baskets of Chitimacha women, they saw these traditional crafts as works of art. 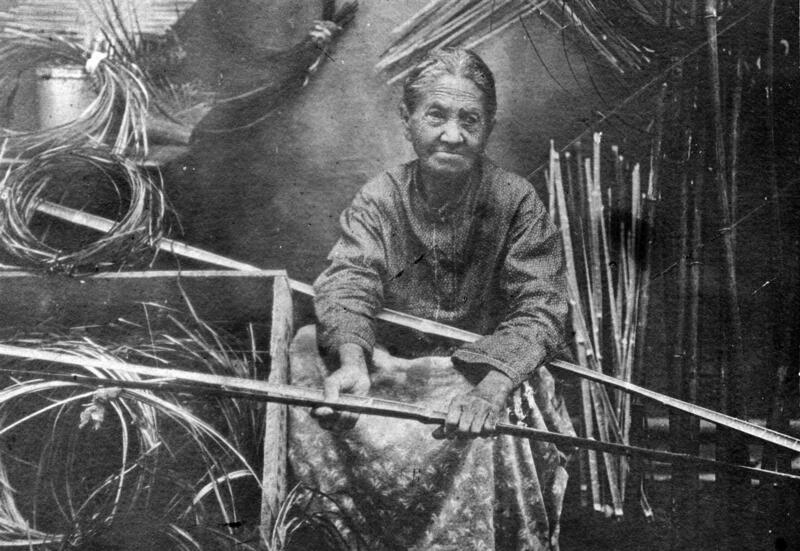 They said to the women weavers, "look, if you keep making this basketry like you've been doing for hundreds, if not thousands, of years, we will market it for you to collectors all around the country, as well as to museums like the Peabody Museum and the Smithsonian in Washington D.C."
And so a business relationship formed between these native and non-native women. And a complex dynamic began. “Certainly our history would be drastically different had there been no relationship with those ladies,” says Kimberley Walden, a Chitimacha and the tribe’s cultural director. "Those ladies" are the McIlhenny sisters. At the turn of the 20th century they turned the tribe into somewhat of a weaving factory. All of a sudden, the women weavers were being asked to produce on an unrealistic scale and schedule. The McIlHenny sisters ordered 100 of these to be produced in a week. Christine Paul wrote back that that was physically impossible. This is where it gets tricky. The McIlhennys were definitely helping the Chitimachas turn a profit, and got their artwork on the national map. But at what cost, and for whose benefit? To allow the native women to work and sell autonomously was to lose control over the trade, and give up this boss lady status. Kim Walden says that’s why Sarah McIlhenny held such a tight leash. Here’s the ugly side to the relationship. The McIlhennys saw themselves as the saviors of this craft, and people. In response, Christine Paul had to walk on eggshells, assuming subservience. 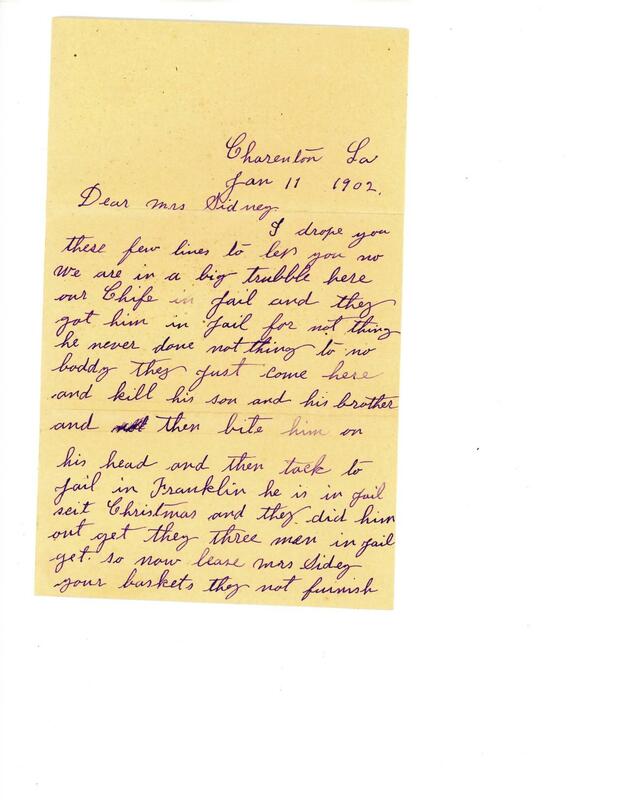 A letter written from Christine Paul to Mary Bradford in 1902 explaining troubles the tribe was experiencing, and why a basket order was going to be late. Kim says there’s no doubt the McIlhennys helped the tribe. Especially when their land was at risk of being taken away by the government. Shane Bernard has records of this in the Avery Island archives. In 1916, the Chitimachas finally won the long struggle to resist displacement and maintain control of their ancestral land. It also shows how the Chitimacha women did hold power, since they’re the reason the McIlhennys advocated for them. Their baskets became a tool to negotiate and defend the rights of their community. Only four weavers now produce Chitimacha baskets. People still ask for them, so Walden is confident the tradition will continue. But weaving is no longer anyone’s full time job. So in some ways, the basket has returned to its original role for the tribe. Something they make -- on their own terms.  Tripod is a production of WWNO -- New Orleans Public Radio, in collaboration with the Historic New Orleans Collection and the University of New Orleans Midlo Center for New Orleans studies. Special thanks to Evan Christopher for the opening theme music. Catch Tripod on the air Thursdays at 8:30 a.m. and Monday afternoons on All Things Considered. To listen to TriPod anytime, subscribe to the podcast on iTunes. Is it cliche to tell a story about Italians that involves wine, extortion and murder? Maybe. Is it about to happen? Definitely. 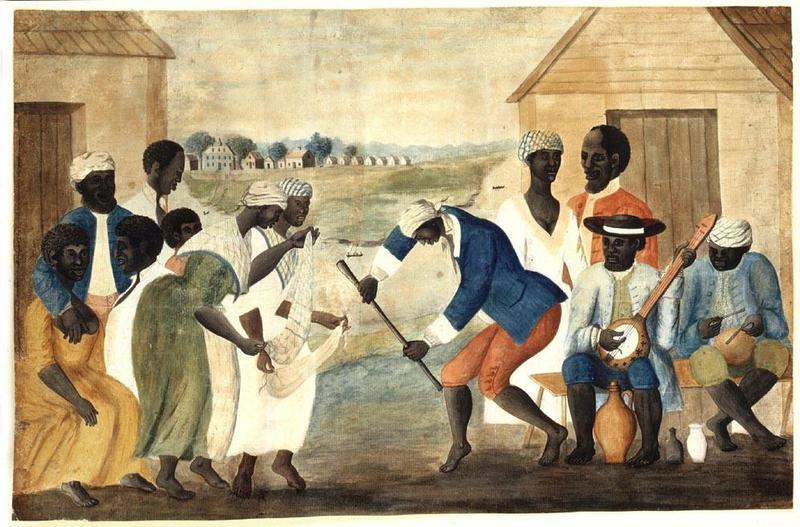 Identity, Self-Expression And Clashes Within The Enslaved Communities Of Colonial Louisiana. Last week’s TriPod saw an example of solidarity in opposition to slavery among people of African descent. 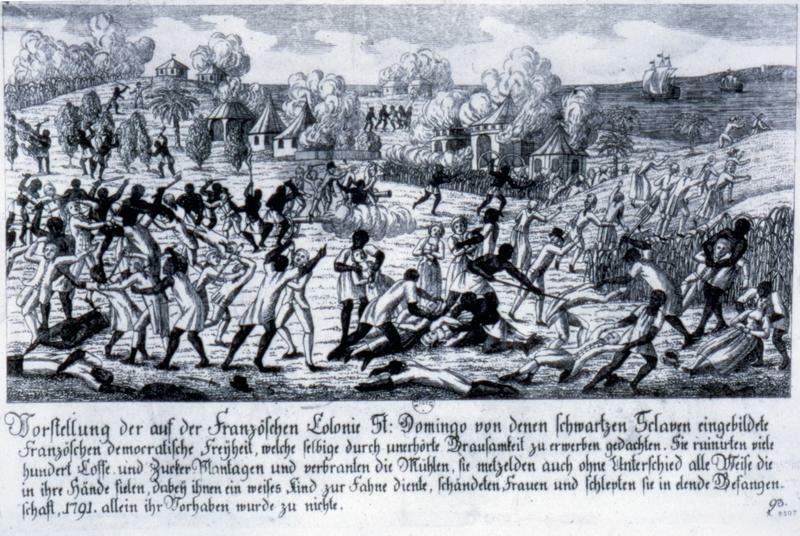 But the dynamics within enslaved communities were complicated, and it was far from one big brotherhood. Allegiances were not automatic, and the story of a runaway named Francisque, who found his way to New Orleans in 1766, shows just that.